From the publisher: In the last five years, Simon's Cat has become a global phenomenon. Star of thirty-nine films, which have been watched over 500 million times, and winner of a dozen major industry awards, Simon's Cat has captured the hearts of a worldwide audience. 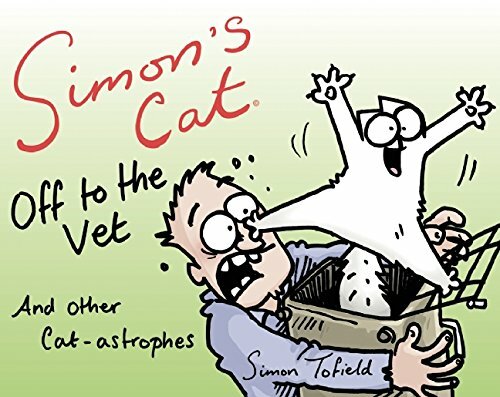 In this brand-new book we see Simon's Cat face any feline's most dreaded scenario--he's off to the vet. And he's not at all happy about it. Sharing its theme with the first-ever full-color Simon's Cat feature animation, funded by a record-breaking Indiegogo campaign and due to be released alongside the new book, Simon's Cat Off to the Vet...and Other Cat-astrophes is packed with over 240 pages of hilarious new gags and adventures featuring our favorite furry friend and his companions--both old and new. This is hard to believe, but although I've watched nearly every Simon's Cat video, this is the first Simon's Cat book that I've read! I couldn't have started with a better one either, because who can't identify with the chaos that ensues when a visit to the vet is in order? From the trickery involved in getting the cat into the box to the vet visit itself where he meets new characters and ends with the vet being wheeled away in a wheelchair...every sketch is pure hilarity. 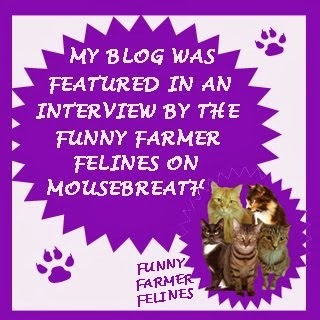 Says Tofield: "Taking my naughty cat to the vet is one of the most requested film ideas from our fans. It was because of this that I started work on a new film and book based on the crazy situations that arise during these trips! 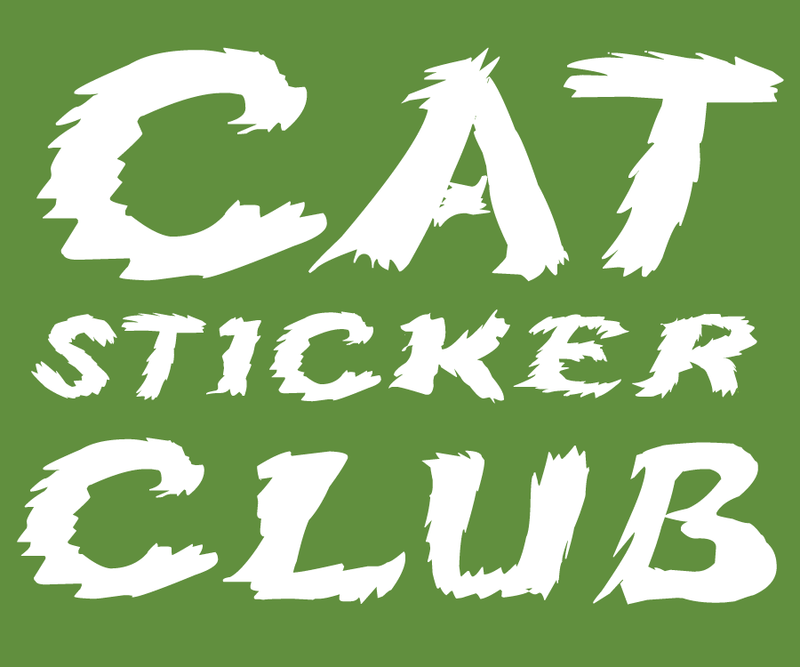 A visit to the vet can be quite a stressful time in real life for both cats and their owners, however my goal is to bring out the comedy, and introduce a cast of extra characters for Simon's Cat to meet, as he gets his claws into his new surroundings!" 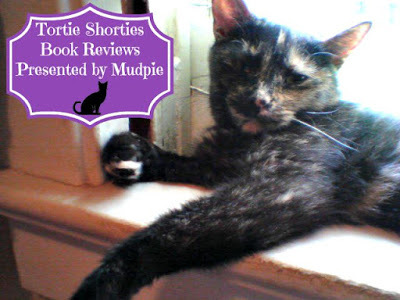 In addition to the vet hijinks, the book features fun vignettes about the cone of shame, and all of our favorite recurring characters, including Kitten, neighborhood birds and other various critters, and of course the grumpy gardener next door. Give the gift of laughter this holiday season...Simon's Cat Off to the Vet would be the purr-fect stocking stuffer for the cat lover in your life. 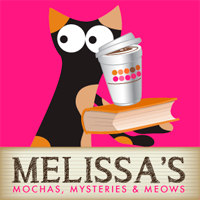 Thanks to Akashic Books I received two advanced reading copies of Simon's Cat, so I have an extra one to give away to a lucky reader! To enter, tell me your craziest experience involving taking a cat to the vet! I will use Random.org to pick a winner at noon eastern on Monday, November 2nd. This giveaway is open to readers worldwide, so good luck everyone! I adore watching Simon's Cat videos on youtube! Simon's Cat Off to the Vet sounds amazing. I don't have any really good stories about taking a cat to the vet. Our kitty loved riding in the car, so taking him to the Vet was easy. He just thought we were going out for fun (but ended up at the Vet's). Thank you for a chance to win. I daren't mention vets at the moment as one of my cats has been there quite a lot recently and I'm crossing my fingers that we are at the end of the visits. I would love to get a copy of Simon's Cat Off to the Vet to read as I've spent so many long waits at our vets there isn't anything left for me to read! We love Simon's Cat videos. He knows just how to depict the universal experiences of everyone who has ever lived with a cat. We love Simon's Cat! We don't have any crazy vet stories...but we sure hate to go there. Love Simon's Cat. I had one cat that just before going to the vet hid in my basement rafters so I had to cancel at last minute. Of course she came out soon after. And I have another that uses all four legs to hold onto the outside cage so he doesn't have to go into it. LOL. We love Simon's Cat books! Hope we win this one! The funniest going to the vet story we have is once Mom took Angel Lilly. The vet was holding her and Lilly was so scared that she started pooping and the poops were dropping into the pocket of the vet's lab coat! Mom couldn't stop laughing but didn't think the vet thought it was that funny! I definitely need to leave my carrier out, in hopes they will get used to it. I have to close doors, so they can't get under beds, when I take the carrier out. Still, chaos ensues as they try to find a hiding place...behind the couch or under furniture. I'm not sure they will ever "like" the carrier, as it means only one thing to them. 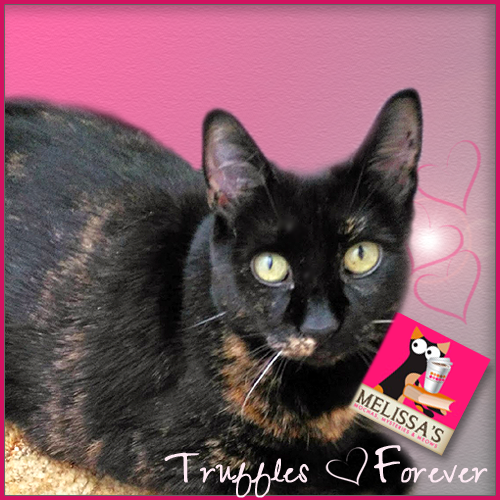 Putting our dialuted Tortie in a carrier to take to the vet causes her to have a seizure. The vet said it's caused by her fright of the carrier and not a concern since she never does it any other time and is in fine health. Before there was carriers my stepmom would get a blanket and coral the cat in a corner to catch her and take her to the vet. I know the dogs thought what is this crazy woman doing to the crazy cat. Carrying an energetic cat in a cardboard carrier (not my brightest moment) and having her errupt out of the box in the car. I live in a small condo but nevertheless my cats manage to hide quite successfully. I now leave the carrier out all the time and even tried putting a blanket it in but they ignore it. One cat hid for an hour before I manged to catch him and stuff him in the carrier. I lost skin and blood along the way. We were an hour late for our appointment, the brat. We love those Simon's Cat videos! 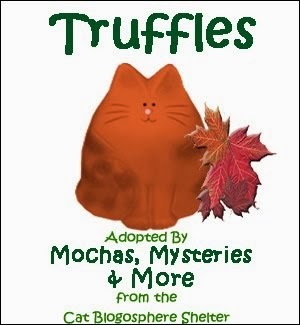 We won this book from the Kitties Blue and are anxiously awaiting its arrival! We need something to laugh about since someTortie has had more than her fair share of vets lately. 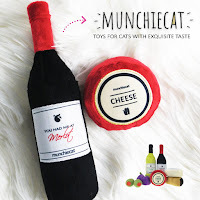 Dat's a pawsum review. Weez not heard of Simon till recently so yous be way ahead of us. My kitties love going to the vet. One of them goes to the vet on a leash. He has no fear of dogs, he usually scares the dogs and they try to hide. The only funny thing that happened was when he cut his paw and when the vet took off the towel I had wrapped it in off, he shook his paw and there was blood everywhere. On the walls, the ceiling, the floor, and all over every ones bodies and clothes . The vet laughed and said I guess we need a couple stitches in that paw and did just that. We have a very cool vet. I love Simon's Cat. Every trip to the vet with Millie is CATastrophic- he always poops then steps in it. We watch Simon’s Cat all the time. He gives me ideas. Heh heh. I can’t wait for the movie. The craziest thing going to the vet was that Truffle managed to unzip the PTU in the car and proceeded to climb into my lap for the trip to the vet. When I took Oreo (aka Cranky Pants) to the Vet she turned into a buzzsaw with teeth and claws and she had to be subdued with gloves and a towel. I'm pretty sure she's on the wall of the Vets office as "Do Not Want to See" (lol) I love Simon.